That is an official Rice Bowling Team shirt from 1956, in mint condition too! 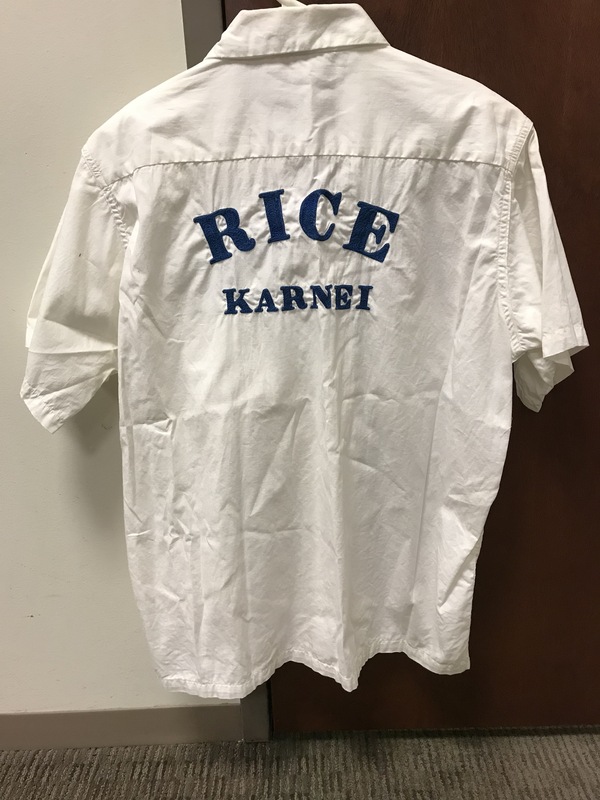 It’s the very first Rice bowling shirt we’ve ever gotten and it belonged to Robert Karnei, Jr. ’56. If that doesn’t turn your frown upside down, I don’t know what will. 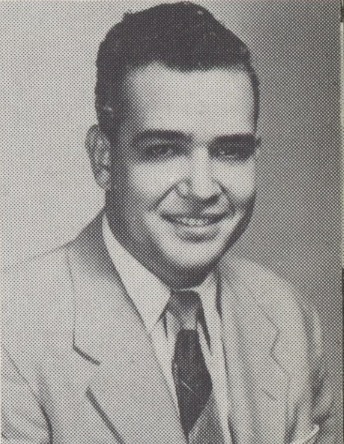 Here’s young Mr. Karnei as a Rice senior. He definitely looks like he could pick up a 7 – 10 split. I can’t help but notice that she never says if she told him that she was sending in his old bowling shirt. Makes me wish I still had my old rugby jersey. Nooo! Not the Comfy Chair! Presumably Mrs. K. is too much of a lady to know that the description of those boards that Dr. K. Is making in the garage is a rude colloquialism in today’s parlance. See the link below to an item on ebay. I am not sure why the world chose that name for this game but it is very common now. Bob did not know I sent the shirt. Having grown up in a Syracuse University family it occurred to me that every institution of “Higher Learning” has a place for Historical items. Let us face facts. We are all becoming relics to our wonderful grandchildren. What could be better!?! I am so happy to hear about y’all’s wonderful life and to know y’all are doing well. Bob and I spent some hours together in various pre-med classes at Rice. Bob, I occasionally see some of the Docs of our Class around Houston and at the reunion. Would like to see you again. Bob, did you do the autopsy on JFK? Dr. Bob assisted with the JFK autopsy but the “high mucky mucks” woke up and came in for the heavy lifting. There are several interviews and articles that talk about his role in the autopsy. A few more interesting things about this amazing couple. Karen was a trailblazer in her own right first by joining the Navy in 1960, then she got married and had 5 children in 5 years (all college graduates), in the midst of this she earning a dual masters in public health & hospital administration from USUHS. Dr. Bob had an extremely impressive military career retiring as the director of the Armed Forces Institute of Pathology, the largest pathological institution in the world. After moving to South Western Virginia Karen, a parish nurse noticed a need for low income families—they had to choose between eating or purchasing their medications. She decided to establish a benevolent medication program that provided over 30 million dollars in free medications to poor and elderly patients over the years. 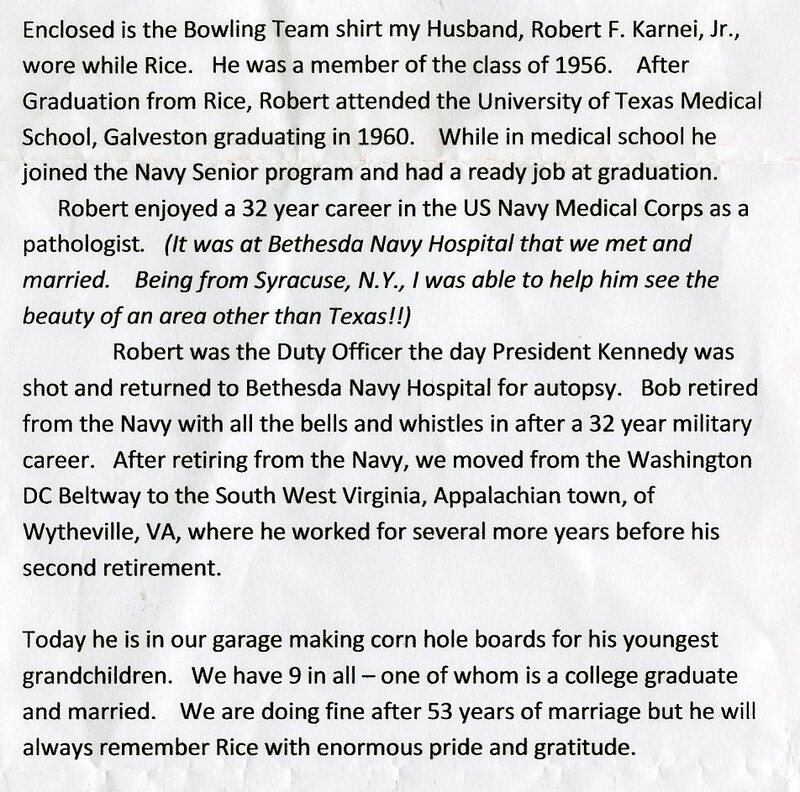 Bob was very active in this endeavor and it was a true mission for our family. Thanks for the extra info, Kathleen. I had to internet-research the USUHS. I had never heard of that university. Kathleen, tell your folks “Hi” for me.